Blogging is just so much fun. Little did I know when I started this space a little under three years ago, I would meet so many wonderful people. One of those lovelies is Stephanie from Wife Mommy Me. I remember when I first met Stephanie, I felt in awe of her blog and all she has accomplished! She works her hiney off and is so great at planning things to bring bloggers today. 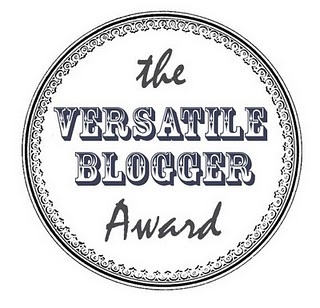 I am thrilled that she nominated me for the Versatile Blogger Award. The rules of accepting this award are simple -- a) thank the person who nominated you b) link back to their blog c) share 7 facts about yourself and d) nominate up to 15 other bloggers. 1// Russ and my official first date was with his parents. I guess he really knew he liked me and wanted them to meet me or something. We went out to dinner and to the movie The Passion of the Christ. Yep. Totally most strange first official date ever. I was back to my dorm room by 9pm. And here we are 12 years and 3 kids later! 3// We live in a somewhat small house in comparison to many around these parts, and I'm totally content. 2 bathrooms. Built in the 70s. Nothing fancy, yet I love it. I love that our mortgage payment is low, we have an attached garage, and we have a nice back yard. To some our house would be a starter home, but to me it's our forever home. 4// When I was little, mom would let us choose our birthday meal, and I usually chose Kraft Macaroni and Cheese. To this days it's still a comfort food. 5// I don't like coffee unless it's a latte, fappuccino, or something fru-fru. I also despise pickles. And olives. And beer. 6// I had a blog on a platform called Posterous before this blog. The website went under, and I didn't do a great job keeping the things from there I should have. It was a great little spark to the little flame I have going here now. 7// I love being a part of the blogging community. You really don't understand it totally until you're immersed in it. It's such a wonderful group of supportive, uplifting, and caring women. I'm so happy be a part of it in so many ways!